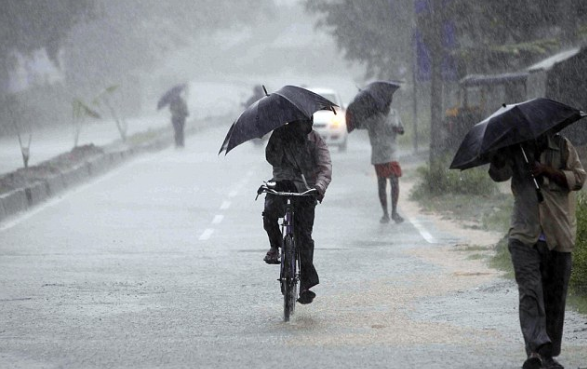 Whenever rainy season comes, we usually take out our umbrellas while going out to office and schools. Mostly, we see government employees and school students covering their heads while raining. But now, it is a motorman (train driver). Most of us eagerly wait for it to rain all through the summer and then wish if it never rained. We are just talking about the issues faced by a lot of people during the rainy season. Rains come and our roads turn into rivers, and our railway track resembles water park. And the latest deluge is leaking trains, yes, leaking trains. 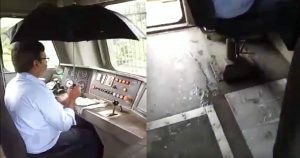 A video that is going viral on the internet shows a motorman holding an umbrella while running a train. The incident took place in Dhanbad, Jharkhand. While the motorman runs the train with much discomfort, he is worried that the water may destroy his control panel. The video shows the motor man wiping water that falls anywhere near the panel. The person recording the video is heard saying that this has been the situation for several years. He says leaky trains during monsoon are quite common and there’s place to keep their bags. It is distressing to see that such things continue in a country which boasts of its satellite launches and growth rate. The motor man is being quite careful and doing his job, wouldn’t it be nice if the authorities responsible for this also take their work seriously? Earlier, pictures of Telangana teachers wearing helmets inside class rooms due to the falling down condition of the building had gone viral. Similarly, pictures of employees of a Bihar government office wearing helmets at work fearing building collapse had gone viral.